Researchers from the University of Michigan used an insulating barrier layer between two graphene sheets to develop the first graphene photodetectors with ultra-broadband and high responsivity at room temperature. Ann Arbor — The first room-temperature light detector that can sense the full infrared spectrum has the potential to put heat vision technology into a contact lens. Unlike comparable mid- and far-infrared detectors currently on the market, the detector developed by University of Michigan engineering researchers doesn’t need bulky cooling equipment to work. Infrared light starts at wavelengths just longer than those of visible red light and stretches to wavelengths up to a millimeter long. Infrared vision may be best known for spotting people and animals in the dark and heat leaks in houses, but it can also help doctors monitor blood flow, identify chemicals in the environment and allow art historians to see Paul Gauguin’s sketches under layers of paint. Unlike the visible spectrum, which conventional cameras capture with a single chip, infrared imaging requires a combination of technologies to see near-, mid- and far-infrared radiation all at once. Still more challenging, the mid-infrared and far-infrared sensors typically need to be at very cold temperatures. Graphene, a single layer of carbon atoms, could sense the whole infrared spectrum—plus visible and ultraviolet light. But until now, it hasn’t been viable for infrared detection because it can’t capture enough light to generate a detectable electrical signal. With one-atom thickness, it only absorbs about 2.3 percent of the light that hits it. If the light can’t produce an electrical signal, graphene can’t be used as a sensor. To overcome that hurdle, Zhong and Ted Norris, the Gerard A. Mourou Professor of Electrical Engineering and Computer Science, worked with graduate students to design a new way of generating the electrical signal. Rather than trying to directly measure the electrons that are freed when light hits the graphene, they amplified the signal by looking instead at how the light-induced electrical charges in the graphene affect a nearby current. To make the device, they put an insulating barrier layer between two graphene sheets. The bottom layer had a current running through it. When light hit the top layer, it freed electrons, creating positively charged holes. Then, the electrons used a quantum mechanical trick to slip through the barrier and into the bottom layer of graphene. The positively charged holes, left behind in the top layer, produced an electric field that affected the flow of electricity through the bottom layer. By measuring the change in current, the team could deduce the brightness of the light hitting the graphene. The new approach allowed the sensitivity of a room-temperature graphene device to compete with that of cooled mid-infrared detectors for the first time. The device is already smaller than a pinky nail and is easily scaled down. Zhong suggests arrays of them as infrared cameras. 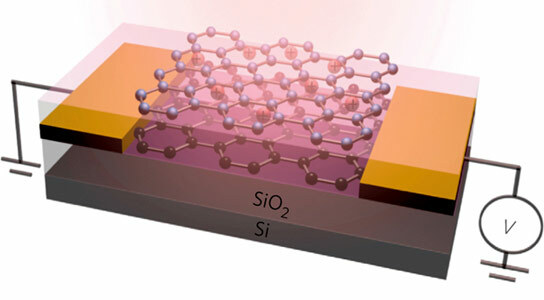 The device is described in a paper titled “Graphene photodetectors with ultra-broadband and high responsivity at room temperature,” which appears online in Nature Nanotechnology. This work was supported by the National Science Foundation in part through Michigan Engineering’s Center for Photonic and Multiscale Nanomaterials, and was carried out with help from electrical engineering and computer science doctoral students Chang-Hua Liu and You-Chia Chang. Be the first to comment on "Graphene Light Detector Has the Potential to Put Heat Vision Technology into a Contact Lens"